I’m guilty…of putting up my Christmas tree lights early. I don’t turn them on until after Thanksgiving but yes, I take advantage of warmer (and drier) evenings in early November to hang the endless strands I zigzag across my front yard. Blame it on my daughter Riley, who when she was in junior high, proclaimed that Christmas lights were her favorite holiday decoration. I tend to be an over-the-top dad so when my kids make confessions like that, I go all out which is why my front yard is already lighting up the neighborhood! But how did some of our favorite holiday house decorating traditions begin? Thought I’d check that out for you and here’s what I found. CHRISTMAS TREES. With 79 percent of Americans putting up a Christmas tree this year, it’s hard to believe that for many years Christmas trees were frowned upon in our country. New England Puritans considered Christmas a sacred occasion and anything that smacked of frivolity was considered heathen. In fact, in 1659, the General Court of Massachusetts passed a law that made any observance of December 25 other than attending church a penal offense. What changed things? The influx of German and Irish immigrants in the 19th century helped to lighten things up. Indoor Christmas trees had been making their way into German homes for years and the notion had begun working its way through Europe. But it wasn’t until 1846 when Great Britain’s popular Queen Victoria and her German husband, Prince Albert, posed for an illustration in a London newspaper of them and their children gathered around a Christmas tree that the tradition started to gain mainstream acceptance. In 1889, President Benjamin Harrison was the first U.S. president to install a Christmas tree in the White House, a tradition that was hit-and-miss for a while, depending on who was in office and whether there were small children around. 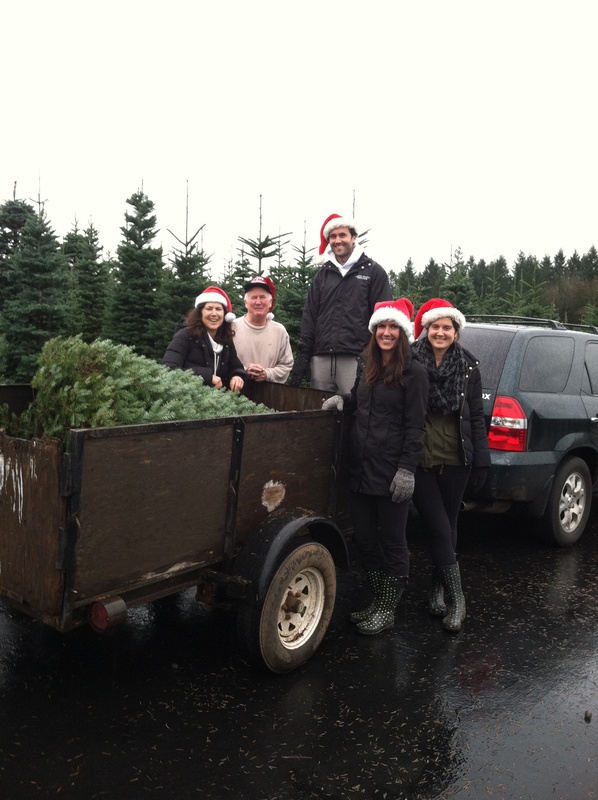 Looking for someplace local to buy your tree this year? Check out my Christmas Tree guide. And for handmade ornaments, be sure to visit the Art Council of Lake Oswego’s Holiday Market. CHRISTMAS LIGHTS. In the beginning, Christmas trees were lit with candles so you can only imagine the fire hazard that presented. Thomas Edison came to the rescue. In 1880, he put together the first strand of electric lights and hung them outside his laboratory. But it was his friend and partner, Edward H. Johnson who adapted the idea to a Christmas tree in 1882. He hand-wired 80 red, white and blue light bulbs and wound them around his tree. The idea didn’t catch on for years. Some credit President Glover Cleveland for making it mainstream by decorating the White House Christmas tree with hundreds of multi-colored lights. Twenty-eight years later, Calvin Coolidge went one step further and started the tradition of lighting up the National Christmas Tree with over 3,000 bulbs. Check out one of my earlier posts on Christmas lights in Lake Oswego. BOUGHS OF HOLLY. Whether hanging on front doors or draped over fireplace mantels, boughs of holly are a popular holiday decoration. But their roots date back to pagan societies who decorated with these branches in tribute to their ability to remain green all year long and as a result were thought to bring goodwill. Holly’s popularity was hard for early Christian leaders to dispel so instead of fighting it, they “rebranded” it, identifying its prickly leaves as symbols of Christ’s crown of thorns and its berries as the drops of blood on Christ’s brow. And the fact that it remained green all year long became a perfect metaphor for eternal life. MISTLETOE. This is one tradition my three kids insist on carrying on. Each year when we buy our Christmas tree, we also purchase three sprigs of mistletoe. How did the kissing tradition begin? We have the ancients to thank once again. While the Greeks and Romans lauded mistletoe for its healing properties, the Druids equated its ability to bloom even in the ice of winter with productiveness and administered it to animals and humans in hopes of restoring fertility. English servants were the first to use mistletoe’s reputation as an excuse to kiss someone. They would steal kisses from a woman caught under the mistletoe, and in some cases, pluck a berry off the sprig with each kiss until all the berries were gone. Here’s to hoping you can be home for the holidays enjoying all the ways you like to decorate your home. If you’d like your home to be in Lake Oswego, give me a call at 503.939.9801 and/or check out my website. As a Realtor in Lake Oswego for over 25 years, I know the market and can help you find the perfect place to call home. This entry was posted in Holidays in Lake Oswego and tagged Holiday decorating, Holiday traditions, Holidays, Lake Oswego Oregon. Bookmark the permalink. You’re welcome anytime! I can find you a great spot!